Note: Remember you can click/touch over the images in order to enlarge them. Implementing your own statistics is incredibly useful since you can customize and track all the data you want, you can track any action in your game and create reports based on the data you have captured, reports that will be very useful to analyze game status, players behavior and to make decisions based on your findings. By combining SQL Reporting Services with Web API 2 you can create a cross platform system. The only other required component is the actual client which will send the data, in Unity we can take advantage of the WWW class to build the message and post the data to the server. First, in the server project, we implement a class to handle our data, in this case we created "GameSessionStatsModel", since we are tracking per session data. Then we implement the actual Controller, we named it "GameStatsController"
In this action we mark the parameter with [FromBody] because we have the data in the body of the message we receive, you could have it with [FromUri] instead in case you are sending the data in the url. 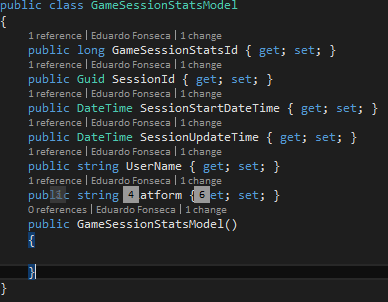 the name of the string must match the exact name of the properties in the class GameSessionStatsModel implemented before. Note: replace serverurl with your correct url. Then we create an instance of the WWW class, we send the url and the form as parameters in the constructor, and we use the yield keyword to execute the request and wait for a response to be received, since in our code we are constantly updating data, we also use WaitForSeconds, with the desired amount of seconds, in this case we are using 5 seconds for testing purposes. Now, let's go to the reports. In this case we created a report to see how many sessions exist for each single platform we send data from. Hopefully it has been useful to you.